Forget Me Not Myosotis Sylvatica is a biennial or short-lived perennial plant native to Europe. Forget Me Not bulk seeds are a great way to start Myosotis Sylvatica if a large coverage is needed. Forget Me Not plant features evergreen, mound-forming, gray-green foliage that is topped with showy clusters of small light-blue flowers with yellow eyes. Forget Me Not blooms from early spring to early summer, and the blossoms look absolutely fabulous when its petite blue star-shaped flowers bloom with spring bulbs. Forget Me Not is excellent in rock gardens, containers, borders, shade gardens, and since Myosotis Sylvatica grows in the wild in streambeds and wet woodlands, Forget Me Not loves water and will grow well in almost any wet spot, so moisture is most important with these species and planting in wet areas of landscape is welcome. Myosotis Sylvatica bulk seeds can be started indoors, and seedlings are easy to transplant to the planned area in a garden. 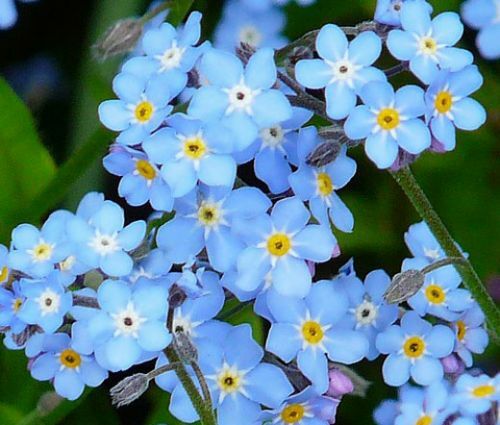 Despite Forget Me Not grows best in cool weather, moist soil, and shade, the plant tolerates full sun, so Forget Me Not can be planted just about anywhere as long as an adequate watering frequency is provided.